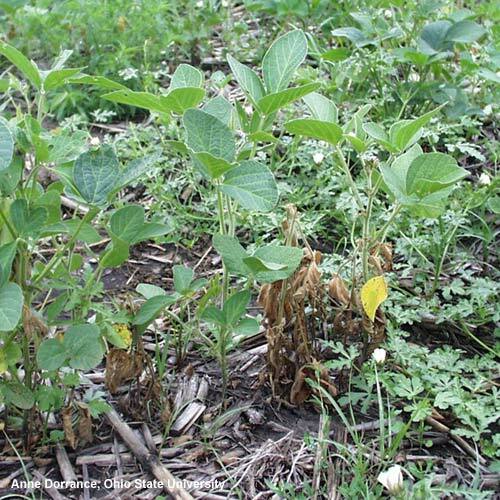 Phytophthora sojae is one of the most destructive soybean pathogens in the north-central region, and a major cause of stand establishment problems. Seeds and seedlings can be infected and killed at any time after the seed has absorbed moisture. The fungus also infects plants later in the season following periods of heavy rain, causing stem rots or chronic root rot. Phytophthora sojae belongs to a group of organisms called oomycetes, also known as “water molds”. This group includes some of the most damaging plant pathogens such as Pythium, Aphanomyces of peas, and downy mildew, and late blight. Zoospores being released from the tip of a sporangium during saturated soil conditions. Warm soil and periodic rains at weekly intervals are ideal conditions for Phytophthora diseases. Optimum conditions for infection are warm soils at a temperature greater than 60°F, and soils that are flooded or saturated. Phytopthora diseases are most common in fields or parts of fields with poor drainage. But they can also occur in well-drained fields when the pathogen is present and the soils are saturated for 7 to 14 days due to heavy rain or irrigation. Phytophthora sojae has a disease cycle unique to fungi that are adapted to saturated soils. Phytophthora survives in soil as spores called oospores which are produced in infected plants. The oospores can survive for many years in soil after plant residues decompose. 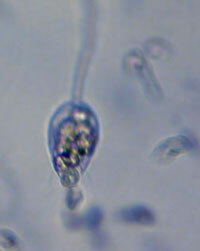 Oospores germinate when there is high soil moisture, forming sporangia. Sporangia germinate directly and infect the root, or they can produce zoospores. Zoospores are tiny, motile spores that are released when soils are flooded or saturated. The motile spores are attracted to seeds and roots by genistein and other isoflavanoid exudates released by soybean roots. 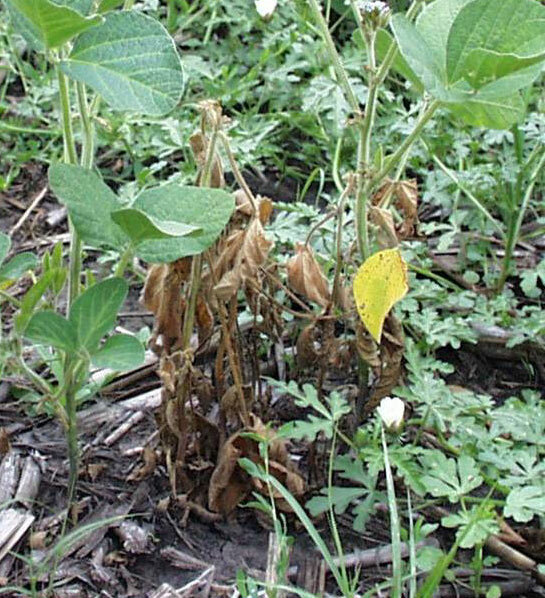 Scout for Phytopthora infection during the early vegetative growth stages, especially if heavy rains occur shortly after planting and soils are warm. If you spot stand establishment problems or no emergence, dig up the seed and check for seed rot. 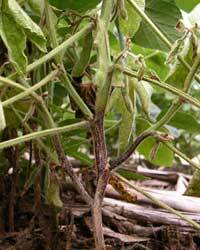 Phytophthora-infected areas of the stem will look water-soaked or bruised and will disintegrate easily. Infected plants are easily pulled from the ground since the root system is damaged. It is difficult to distinguish Phytophthora root rot from Pythium root rot at this stage. Both diseases cause taproot and lateral root rot and root pruning. Generally, Pythium is active in cold soils, and Phytophthora active in warm soils. If damping-off is a problem in the spring, be on the look-out for Phytophthora infection following rainy periods later in the season, too. You'll recognize it by a distinct chocolate-brown lesion moving up the stem from the soil line. P. sojae slowly girdles its host, causing wilting, yellowing and death. The root rot phase of Phytophthora is not as readily recognized as the stem rot phase. Infected plants can be stunted and less vigorous, although this is hard to spot unless the infected plants are near a healthy comparison. low and wet spots in a field. fields with high clay content. fields that have been in no-till for a few years. weedy areas that may be the result of stand reduction earlier in the season. Stem canker, caused by the fungus Diaporthe can look similar to stem rot symptoms of Phytophthora. One way to separate stem canker and Phytophthora stem and root rot is to check whether diseased plants have root rot because the stem canker pathogen causes only stem lesions and not root rot. Phytophthora stem symptoms. Photo: University of Wisconsin. 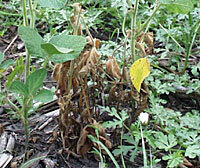 Phytophthora sojae can infect and kill soybean plants at all stages of growth, from seedlings to older stands. Infected stands may survive but are less productive than healthy stands. 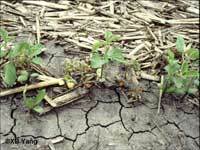 Soybean seeds can be infected before they emerge, causing them to rot. Phytophthora can kill young seedlings shortly after emergence as well. Plants infected at this stage will show typical "damping-off" disease symptoms. Several other pathogens can cause damping off at this stage, too, such as Pythium and Rhizoctonia. Generally, damping off by Pythium occurs when soils are still cold, while Phytophthora fungi are active when soils warm to 60°F or higher. Laboratory tests can distinguish seed and seedling rot caused by Phytophthora sojae from Pythium or other seed-rotting fungi at this stage. Symptoms of infection at later growth stages may include yellowing, wilting and death of plants, or stunting and yellowing with no death. The symptoms will develop 5 to 14 days after soil has been saturated and are often confused with flood damage, or can occur along with flood damage. Flooding injury to soybeans destroys the cortical cells of the roots but leaves the root stele (center) intact. Phytophthora grows in all parts of the soybean roots and turns the entire root tissue a tan to dark brown color. A key diagnostic symptom of Phytophthora stem rot is a brown lesion that develops from the roots and progresses up the stem from the soil line. The key difference between Phytophthora stem rot and other stem cankers is that there will be few or no roots on a plant that was infected by P. sojae, and it will be evident that the infection occurs from the base of the plant. Other pathogens that cause stem canker do not cause root rot. On occasion, the Phytophthora lesion may develop on only one side of the soybean stem. Cut the stems open to determine if the internal tissues are colonized from the soil line to the top of the lesion. The root rot phase is not as readily recognized as the killing stem rot phase. Plants will be a lighter green, and may be stunted and exhibit uneven growth. Stems of older plants may become watersoaked and eventually the leaves will turn yellow, wilt, and die. These symptoms are the secondary effects of an impaired root system that is less efficient in supplying the plant with water and nutrients. Yield losses caused by Phytophthora sojae can be substantial, especially in areas that have been in soybean production for many years. Entire fields can be destroyed when conditions are right. The amount of damage depends on the soybean growth stage and the level of partial resistance that a soybean variety has to P. sojae. Stands that are highly susceptible and are infected early suffer the largest losses. 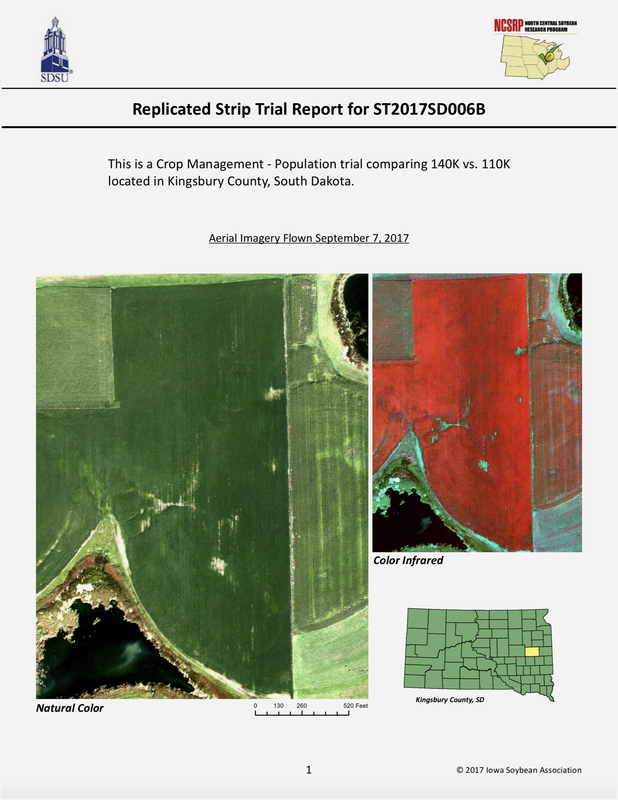 Replanting costs plus reduced yields due to later planting dates are the hidden costs of Phytophthora infection early in the season. 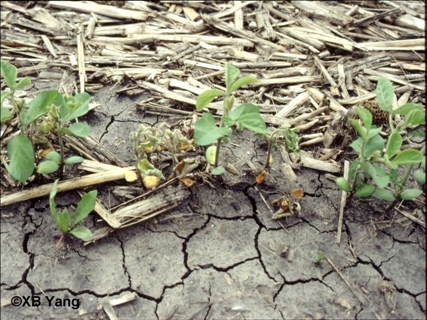 The disease can affect soybeans at any stage of development but is often most damaging when it occurs early in the season. Field history of Phythophthora or a history of stand establishment problems. Years in soybean production - risk increases with more years in soybean production. Heavy rains following planting; wet and warm weather conditions in the spring. Disease development is most rapid at soil temperatures above 60°F with high soil moisture. Variety selection is the key for managing Phytophthora stem and root rot. 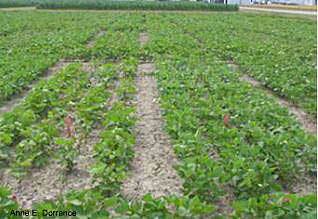 There are two different types of genetic resistance available in soybean varieties. Single-gene resistance is a complete resistance to a specific pathotype of P. sojae, in which the fungus is unable to colonize the plant tissue. 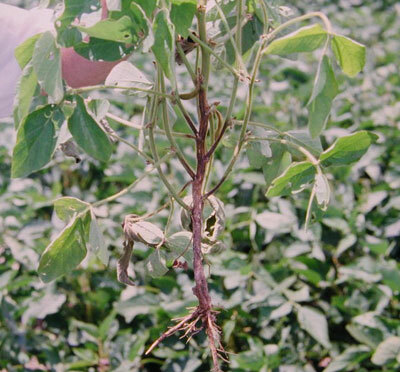 Many soybean varieties have resistance genes, called Rps for “resistant to Phytophthora sojae”. The most common Rps genes that are available include Rps1a, Rps1c, Rps1k, Rps3a, and Rps6 or a combination of one or more Rps genes. This information is available in seed catalogs and in state variety evaluations. Varieties with the same resistance genes may perform differently because of different levels of partial resistance (also called quantitative resistance or field resistance) to all pathotypes of Phytopthora. 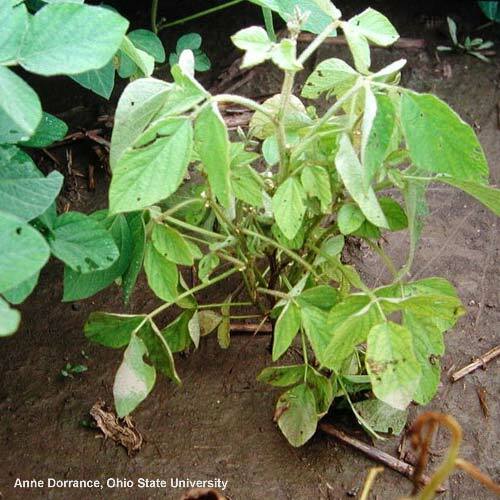 Soybean varieties with high levels of partial resistance can become infected with P. sojae but symptoms are not as severe as varieties that are highly susceptible. Partial resistance will not be as effective during the first 7-10 days until seedlings are established, or when disease pressure is high. Growers should monitor the performance of the resistance package of the soybean varieties they choose. 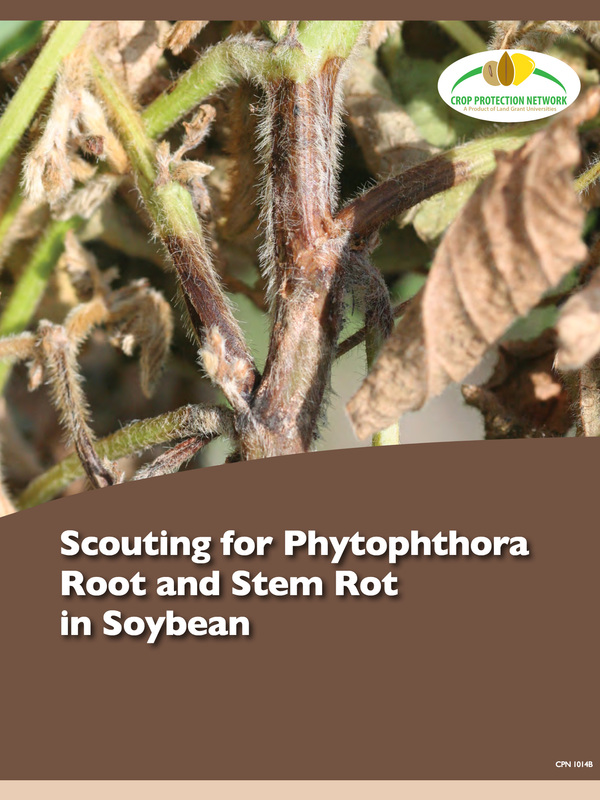 If optimum disease conditions for Phytophthora infection occur during the growing season, scout those areas of the fields to look for stem rot development. If a large number of plants with Phytophthora stem rot are found, make a note to choose varieties with a different Rps gene and higher levels of partial resistance for the next season. 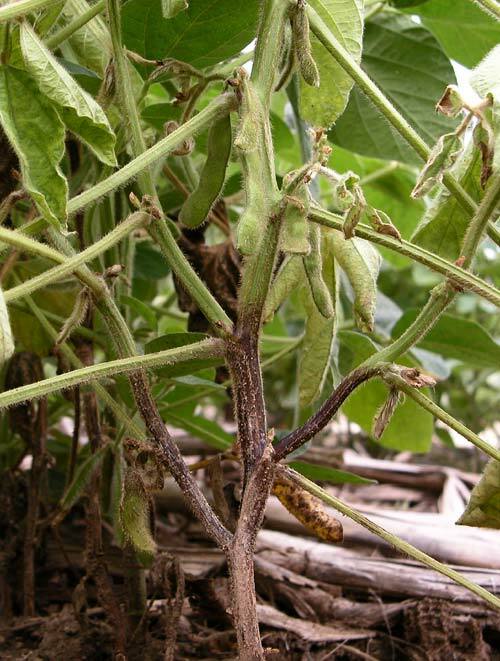 Phytophthora is known to adapt to the Rps genes of soybean varieties, but it's a slow process. Careful monitoring of plant performance is all that is needed. If a large number of plants with Phytophthora stem rot are found when optimum disease conditions occur, this may indicate that a new pathotype has become dominant in your field. University soybean researchers in the north-central region are actively monitoring Phytophthora pathotypes in order to advise soybean seed companies of changes in Phytophthora populations. 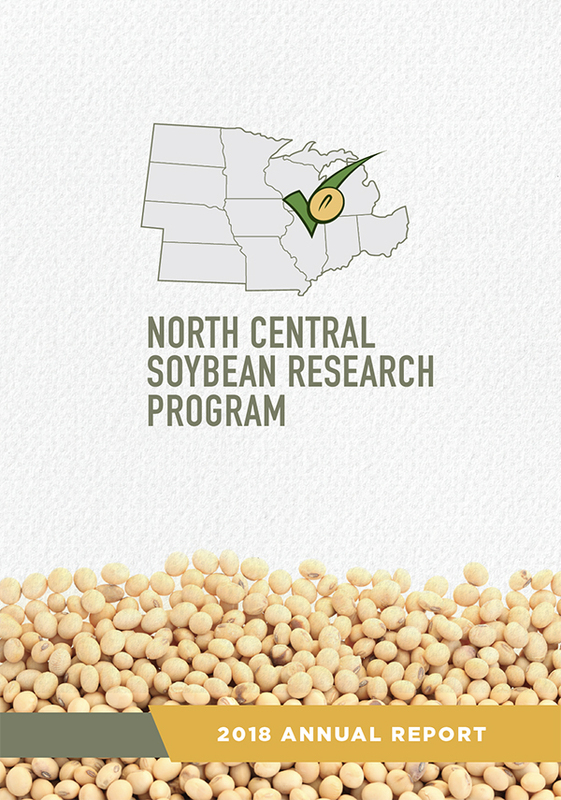 Switching or stacking Rps genes in new soybean varieties may be recommended. Wet and waterlogged soils provide a favorable environment for many soilborne pathogens including P. sojae. Use good soil management practices. Improve soil drainage through tiling or tillage, except when tillage will compact the soil. Compact soil and poor soil structure leads to poor aeration and increased disease levels. Crop rotation prevents the rapid build-up of inoculum but will not eliminate the disease or eradicate Phytophthora because the oospores can survive in the soil for long periods of time. 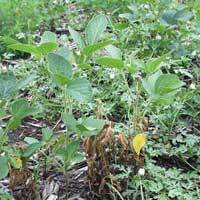 However, planting soybeans year after year can increase the Phytophthora population in the soil and promote the development of new pathotypes. Under high levels of inoculum, the effectiveness of partial resistance declines.